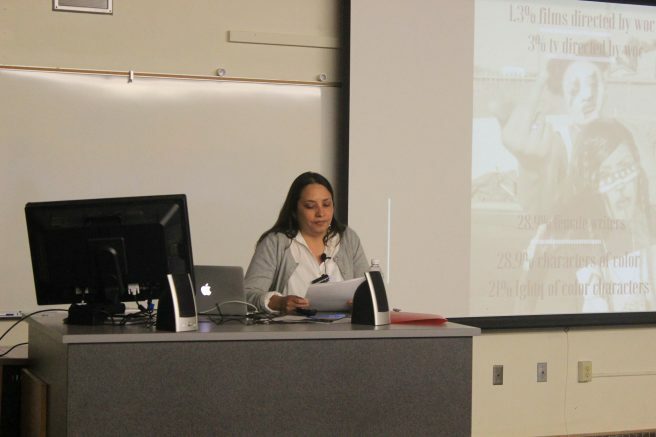 UNITE hosted Aurora Guerro, a strong activist in the film industry, on Thursday in Raef Hall 160. She began by addressing her concerns about the elelction. She grew up in San Francisco in a home where being queer in a Mexican family wasn’t allowed. Even though San Francisco is a very open and liberal now, it wasn’t always this way. During her presentations she showed clips of her art and described what each film represented. Each piece was influenced by the queer Chicano culture. Her first film introduced was about police brutality towards Chicanos and queers. During the film she showed raw footage of a young chicano women being assaulted because she was gay and didn’t have the “proper” american look when she was walking down the street. It showed police beating the women until she was no longer able to fight back. Guerro’s film pieces have been considered for several networks including Netflix, Hulu, Amazon, and HBO. The police brutality film was picked up by HBO and Sundance in the year 2015. “Mosquita y Mari” is another film directed by Guerro. It was a youth break silence movie. It was a story about her silence in her sexuality. When writing “Mosquita y Mari”, she wanted to honor herself and announce how powerful she was going to be. The film opened up with two 15 year old girls daydreaming about what there life would become outside of their lives. “It’s hard for queers to be open and free, and the film Aurora showed us really was eye opening and harsh. I feel bad,” said ARC student Jennifer Martin. “What has been essential in my journey, was that I was never alone and you guys shouldn’t be either,” Guerro said. Cierra is a first-semester student on the Current, where she serves as scene editor. She is majoring in journalism, minoring in mass communications and plans on transferring to San Francisco State. Be the first to comment on "Chicano filmmaker presents movie about police brutality"